MSCI has decided to retain Nigeria in its Frontier Market Indices, ruling out the possibility of reclassification to ‘standalone’ status. In an announcement last week, MSCI announced that it would remove Nigeria indices from its review list and no longer apply special treatment to the country’s indices. On April 29, 2016 the MSCI had put MSCI Nigeria Indices under review for a potential reclassification to “standalone status” due to foreign exchange market challenges that have hampered repatriation of capital by institutional investors. Morgan Stanley analysts stated that restrictions on foreign currency trading that were imposed in 2015 led to a decline in market accessibility for foreign investors resulting in the MSCI placing Nigeria on a review list for potential reclassification to standalone status in September 2016. However, recently the Central Bank of Nigeria’s constant supply of foreign exchange to markets has improved liquidity. MSCI also increased the weights of Nigeria stocks to 7.9% from 6.5% in its frontier market index. The MSCI Frontier Market Index comprises of 16 companies listed on the Nigeria Stock Exchange, including Nigerian Breweries, Guaranty Trust Bank, Zenith Bank, Nestle Nigeria, Dangote Cement, Forte Oil, Seplat Petroleum Development Company and FBN Holdings. Countries and stocks that get included in the MSCI indices usually attract fund flows. There are passive funds that track these inclusions to keep tabs on overall market sentiment. Index weighting and composition is an important metric for investors as fund managers and foreign investors try to mimic the index when allocating their funds and building their portfolios. Countries and stocks that are included in the MSCI Index generally see higher allocations from foreign investors. The addition of stocks to major indices also increase overall trading volumes and thereby the underlying returns. Conversely, removal can lead to outflows from the country’s stock’s markets. Foreign investors seeking exposure to Nigeria can invest in country-focused ETFs that offer diversification through investment in a single US security. Alternatively, investors wanting direct exposure could consider ADRs of Nigerian companies. 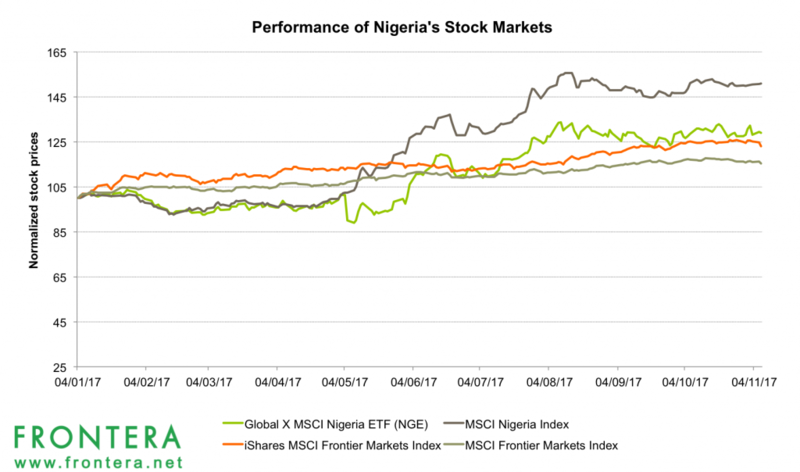 The most popular ETF for U.S. investors is the Global X MSCI Nigeria ETF (NGE). The Global X MSCI Nigeria ETF (NGE) invests in 20 of the most liquid companies in Nigeria. With assets under management of $63.5 million, the NGE ETF offers concentrated exposure to Nigerian companies. Financials are the top sector accounting for 51% of assets, followed by consumer staples, materials and energy. The funds top five holdings constitute ~50% of its assets, making it fairly concentrated. The fund is up 13.7% over the last one-year period, and year to date in 2017 it has gained 23.7%. Year to date, the MSCI Nigeria Index has surged 47% while the Nigerian benchmark Nigerian Stock Exchange index has gained 37%. Comparatively, the MSCI Nigeria Index has returned 51%. 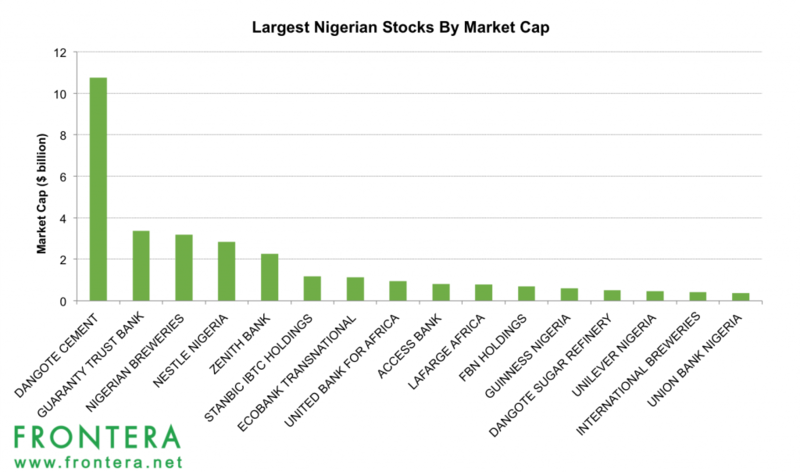 The largest Nigerian stocks by market capitalization are Dangote Cement, Guaranty Trust Bank, Nigerian Breweries, Nestle Nigeria, Zenith Bank, Stanbic Ibtc Holdings, Ecobank Transnational, United Bank For Africa, Access Bank, Lafarge Africa, Fbn Holdings , Guinness Nigeria , Dangote Sugar Refinery , Unilever Nigeria , International Breweries and Union Bank of Nigeria. Dangote Cement, a subsidiary of Dangote Group, is the largest company trading on the Nigerian Stock Exchange with a market cap of $10.8 billion. The company is engaged in the manufacture, preparation, import, packaging, and distribution of cement and related products in 13 countries across Africa, and has three plants in Nigeria. It is Nigeria’s biggest cement producer with annual production of 23.6 million tonnes in 2016 and revenues of $1.7 billion. The company trades on the Nigerian stock exchange with ticker DANGCEM.NL. Year to date, shares of the company have returned 39.7%. GT Bank, also called Guaranty Trust Bank, is Nigeria’s largest bank by assets and market capitalization with the latter standing at $3.4 billion. GT Bank listed its shares on the London and German Bourses in 2007, and raised $750 million. In 2016, GTBank generated revenues of $1.7 billion and net interest margins of 9.7%. The bank reported return on assets of 4.7% and return on equity of 29.1% last year. GTBank‘s shares trade on the Nigerian, Frankfurt, Stuttgart and London Stock Exchanges with tickers GUARANTY.NL, 37G1.F, 37G1.SG, and GRTB.IL. The bank’s Nigeria listed shares have surged 107% in 2017 thus far. 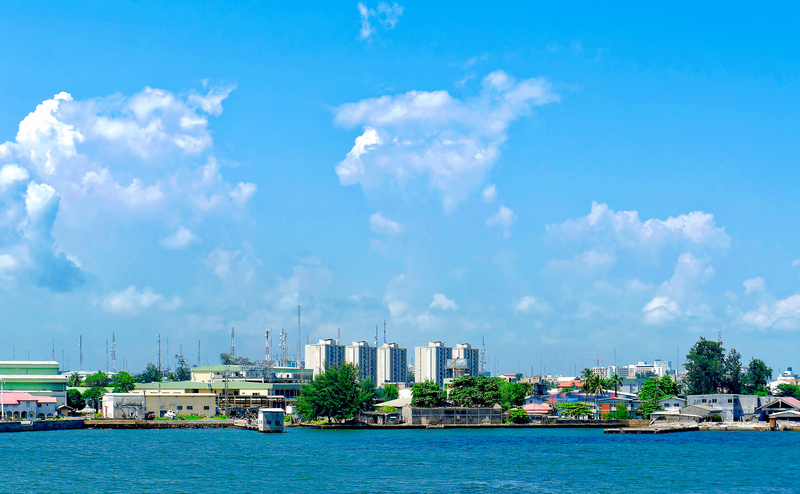 Nigerian Breweries is the largest brewer in Nigeria serving parts of West Africa and Nigeria. The company has eleven operational breweries across Nigeria and malting plants in Aba and Kaduna and 26 sales depots. It also focuses on ancillary business, which includes manufacturing cans, labels, cartons and bottles. Additionally, it runs an export business. The company’s products are distributed in over thirteen countries, across the United Kingdom, South Africa, Middle-East, West Africa and the United States of America. In 2016, Nigerian Breweries generated revenues of $1.1 billion. The company trades on the Nigerian Stock Exchange with ticker NB.NL and has a market capitalization of $3.2 billion. Year to date, shares of the company have returned 4.2%. In 2016, the company generated revenues of $738 million. The company trades on the Nigerian stock exchange with ticker NESTLE.NL and has a market capitalization of $2.8 billion. Year to date, shares of the company have returned 60.4%. Zenith Bank is one of the banks in Nigeria with assets of nearly $13 billion in 2016. 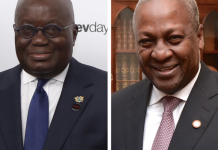 The bank was established in 1990 and currently had nearly 500 branches across the country as well as in UK, UAE, Ghana, Sierra Leone and the Gambia. The bank also has offices in South Africa and China. In 2016, Zenith Bank reported revenues of $2.1 billion and held assets of $13.2 billion. In 2013, Zenith Bank raised $850 million from an IPO on the London Stock Exchange. The company trades on the Lagos and London stock exchanges with ticker ZENITHBA.NL and ZENB.LI. Zenith Bank has a market capitalization of $2.3 billion on the Nigerian stock exchange and has returned 9% in 2017 so far. Stanbic IBTC Holdings, is an end to end financial services provider with businesses ranging from banking, stock brokerage, investment advisory, pension and trustees. The bank is a member of South Africa based financial services giant Standard Bank Group. In 2016, the bank reported revenues of $607 million and assets of $2.9 billion. The company trades on the Nigerian stock exchange with ticker STANBIC.NL and has a market capitalisation of $1.2 billion. Year to date, shares of the company have returned 155%. Ecobank is a pana-African bank with operations in nearly 36 countries across the continent. It the the largest independent regional bank in Western and Central Africa, and operates through subsidiaries in Eastern and Southern Africa. 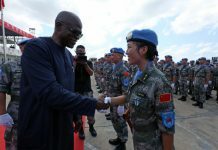 The bank also has a presence in Angola, China, Dubai, France, South Africa, and the United Kingdom. The bank reported revenues of $2.5 billion and assets of $20.5 billion in 2016. The company trades on the Nigerian stock exchange with ticker ETI.NL and has a market capitalization of $1.1 billion. Year to date, shares of the company have returned 87%. United Bank for Africa is one of Africa’s more resilient banks with operations across 19 African nations along with offices in London, Paris and New York. UBA has more than eight million customers and 700 business offices globally. In 2016, the bank reported revenues of $1.4 billion and assets of $9.7 billion. The company trades on the Nigerian stock exchange with ticker UBA.NL and has a market capitalization of $941 million. Year to date, shares of the company have returned 157%. Access Bank, is a commercial bank owned by Nigeria based Access Bank Group. 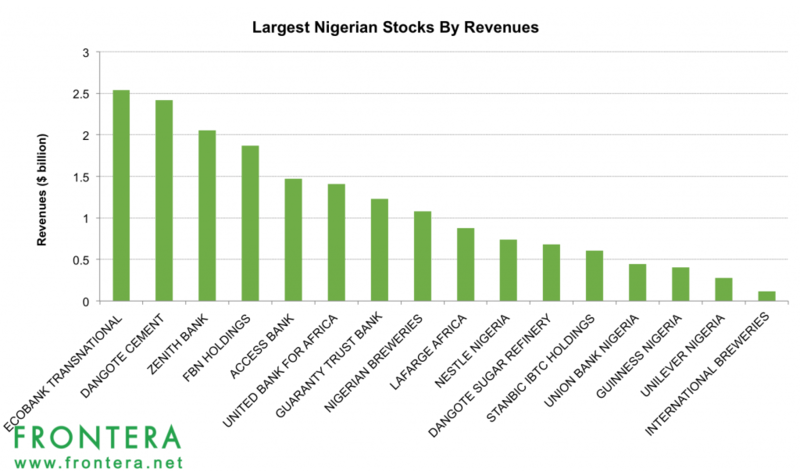 The company is among the five largest Nigerian banks in terms of assets, loans, deposits and branch network. As of December 2016, the bank had an asset base of $9.6 billion and revenues of $1.5 billion. The company trades on the Nigierian stock exchange with ticker ACCESS.NL and has a market capitalization of $811 million. Year to date, shares of the company have returned 101%. Lafarge Africa is a subsidiary of Lafarge Holcim serving Nigerian and South Africa with cement solutions to meet building and construction requirements. Lafarge Africa has a current installed cement capacity of 12 million metrics tonnes (MMT), which is expected to grow to 18MMT by 2020. In 2016, the company generated revenues of $879 million. The company trades on the Nigerian stock exchange with ticker WAPCO.NL and has a market cap of $785 million. Year to date, shares of the company have returned 1.3%. FBN holdings provides financial services in Nigeria through its various subsidiaries. The company is engaged in commercial banking, investment banking, insurance services, and merchant banking among other banking services. In 2016, the company reported revenues of $1.9 billion and assets of $13.2 billion. The company trades on the Nigerian stock exchange with ticker GUINNESS.NL and has a market capitalization of $703 million. Year to date, shares of the company have returned 144%. Guinness Nigeria is a subsidiary of UK based brewer Diageo. The company was established in 1962 with its first brewery in Ikeja. In 2016, the company reported revenues of $401 million. The company trades on the Nigerian stock exchange with ticker FBNH.NL and has a market capitalization of $608 million. Year to date, shares of the company have returned 23%. Dangote Sugar is a subsidiary of Nigerian conglomerate Dangote Group. It’s the currently the largest sugar refining company in sub-Saharan Africa, competing with Bua Refinery Ltd. and Golden Sugar. The company generated revenues of $680 million in 2016. Dangote Sugar trades on the Nigerian stock exchange with ticker DANGSUGA.NL and has a market capitalization of $513 million. Year to date, shares of the company have returned 189%. Unilever Nigeria is a subsidiary of FMCG giant Unilever and is engaged in manufacture and market of food and home care products in Nigeria. The Company has manufacturing sites in Oregun, Lagos State and Agbara, Ogun State. In 2016, the company reported revenues of $276 million. The company trades on the Nigerian stock exchange with ticker UNILEVER.NL and has a market capitalization of $475 million. Year to date, shares of the company have returned -8.2%. International Breweries is a Nigeria based brewery currently operated by SABMiller. The company listed on the Nigerian Stock Exchange in 1994. In 2016, International Breweries reported revenues of $114 million. The company trades on the Nigerian stock exchange with ticker INTBREW.NL and has a market capitalization of $429 million. Year to date, shares of the company have returned 114%. Union Bank is a Nigeria-based commercial bank serving retail as well as corporate clients. The bank has a vast network of branches across Nigeria as well as in Cotonou, Benin and London. It also maintains a representative office in Johannesburg. As of December 2016, the bank had an asset base of $3.5 billion and revenues of $443 million. The company trades on the Nigerian stock exchange with ticker UBN.NL and has a market capitalization of $363 million. Year to date, shares of the company have returned 64%. Next articleWill Stocks Keep Rising And The Peso Finally Stabilize After The Latest Rate Hike In Argentina?